I have been “poorly” as they say here in Britain, meaning that I have been under the weather for a few days, so I didn’t make it into the city yesterday as I had planned. But, with all the trains, planes and automobiles lately I have gotten plenty of reading done in anticipation of my upcoming articles for the ezine, so here is a book review to tide you over until I can start posting about London in earnest. I chose to do an in-depth article on Around the World in 80 Days mostly as an excuse to watch the 1956 movie again that I remembered from my childhood, but of course I needed to start with the text itself. I won’t go into a lengthy synopsis here because I will be doing that for my upcoming Sourcebook, so I’ll skip straight to the review. I really expected to adore this book and it had all the makings of greatness, but all and all I’d say this one isn’t a must-read for a Steampunk or a Jules Verne fan. The voice of the narration is inconsistent and swings between third-person omniscient and totally opaque, especially when it comes to Detective Fix who is pursuing Fogg through his journey on suspicion of bank robbery. I also felt like the action, the real meat of the adventure, was often treated as a footnote with very little description whereas the reader must sit through several pages of Mormon history and detailed itineraries of exactly where their train is stopping. For instance, Passepartout is taken hostage by the Sioux during the trek across America, but all we know if the daring rescue is that Aouda and Fix paced a lot while waiting. There are definitely gaps that would be fun for an author to try to fill, and indeed Philip Jose Farmer attempted to do just that in his novel The Other Log of Phileas Fogg, which is the next book I will review. This entry was posted on August 19, 2014 by Phoebe Darqueling. It was filed under Books, Graphic Novels and Adaptations, Entertainment and was tagged with Around the World in 80 Days, Book Reviews, Books, Jules Verne, Passepartout, Phileas Fogg, steam punk, Steampunk. It’s interesting to see how much writing has changed over the past hundred years or so. So much of what we now consider to be fundamental to good storytelling simply isn’t there in some older books that are considered classics. It’s great to know how much they’ve inspired people over the years, as 80 Days has, and also great to realise that we keep on getting better at this stuff. 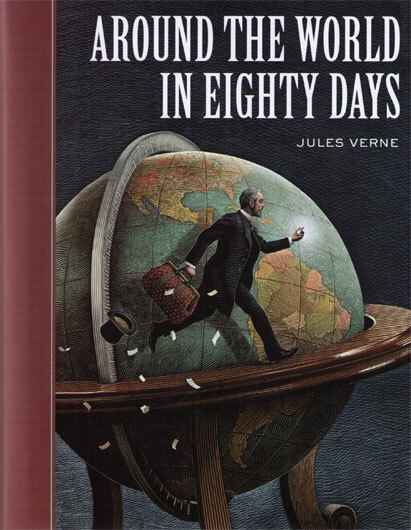 I can’t remember if I’ve ever read the original novel of 80 Days – my main knowledge of the story comes from the cartoon version in which Fogg was a lion. I can still sing most of the theme tune, so it clearly caught my imagination as a kid!